Does vandalism really help your cause? I took these pictures yesterday afternoon. My, how clever. 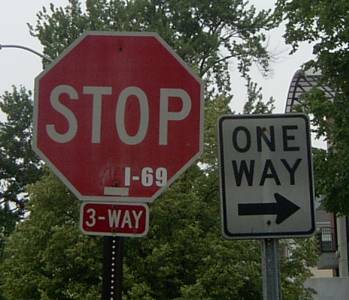 I am certain that the practice of putting "I-69" stickers on stop signs will not only convince people on the fence to oppose the interstate highway, it will change the minds of highway supporters. 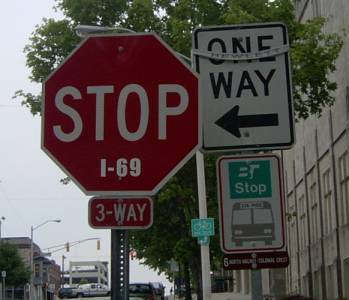 Any hope of building an interstate highway connecting Indianapolis and Evansville has been erased by arguably the most effective method of argumentation I have ever seen. Or not. 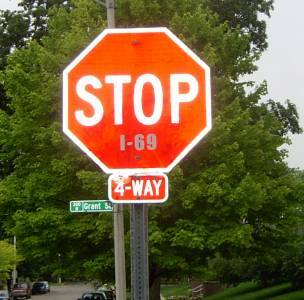 Of course, past actions by radical opponents of I-69 have been a lot worse than vandalizing a few stop signs. 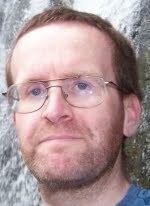 In September of 2000, the Earth Liberation Front attempted to burn down Monroe County Republican Party headquarters because of John Hostettler's support for I-69. (See Herald-Times stories here, here, here and here.) The arson was a frightening example of just how far some radical environmental activists will go to force their beliefs on everyone else. In 2002, former Monroe County Commissioner and Bloomington City Councilor Kirk White was confronted by irate highway opponents at a public hearing on I-69 after he spoke in favor of building the highway. White had to be escorted out of the meeting by police officers for his own safety. At the same meeting, IU law professor Cathy Crosson lit up an Indiana Department of Transportation official with a profanity-filled tirade, daring him to have her arrested. Why do some highway opponents feel they are above the law? Why do some highway opponents feel they have the right to vandalize public property if it provides a platform for their views? There are numerous opportunities to make public statements opposing the extension of Interstate 69. Last year, the Bloomington City Council passed a resolution opposing I-69 and there are organizations like Citizens for Appropriate Rural Roads that actively oppose the highway. There are letters to the editor in the Herald-Times on a regular basis opposing the highway. Instead, the Seventh Street vandals took the cowardly way out. Instead of putting their name on a letter to the editor or a petition, they vandalized public property. Now that vandalism must be cleaned up. Such uncivil behavior has no place in discourse on public policy. 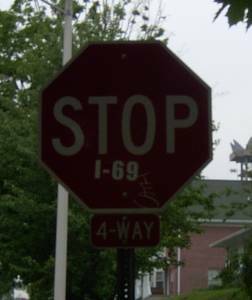 I challenge the Seventh Street vandals to express their opposition to the highway in a legal and non-destructive manner.